The governments of Japan and the United States are moving forward with their plan to relocate U.S. Marine Corps Air Station Futenma to Henoko, Nago. On January 20, workers employed by Okinawa Defense Bureau set up an oil fence from off the coast of Camp Schwab to Oura Bay and dropped anchors on the seabed. According to the defense bureau, the anchors stop the oil fence from being swept away by wave. A line, indicating a temporary restricted area, expands to near the Sedake community, cutting into the deep-blue sea. Screams were heard among members of ‘Canoe Corps’, who are protesting in order to stop the construction work for a new U.S. base. “This is an arrogant way. Their action is like stabbing a sword into Okinawan people’s will,” a member said. There is a growing backlash against Japan Coast Guard from citizens, because they are removing the protesters with the help of the Okinawa Defense Bureau. A large Okinawa People’s organization, which is against moving the U.S. base within Okinawa and consists of the Okinawa Peace Movement Center, the Helicopter Base Objection Association and other anti-war groups, plans to hold a protest rally in front of the 11th Regional Coast Guard Headquarters in Naha. They will hold a regular protest gathering in front of Nakagusuku Coast Guard Office. 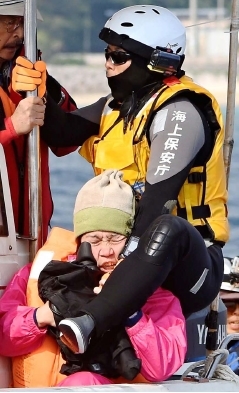 A woman, who was injured by officers during protest action on the sea on January 19, is considering a complaint against them. A man who broke his rib on January 16 will bring an accusation against an officer. Reporters witnessed a scene in which an officer put his leg on the shoulder of a woman holding a camera on January 20, when the coast guard apprehended protest canoes and ships. The coast guard removed a protest ship on which reporters rode, by dragging it with a rope out of the temporary restricted area. The coast guard interfered with the reporters’ free news coverage for 35 minutes.